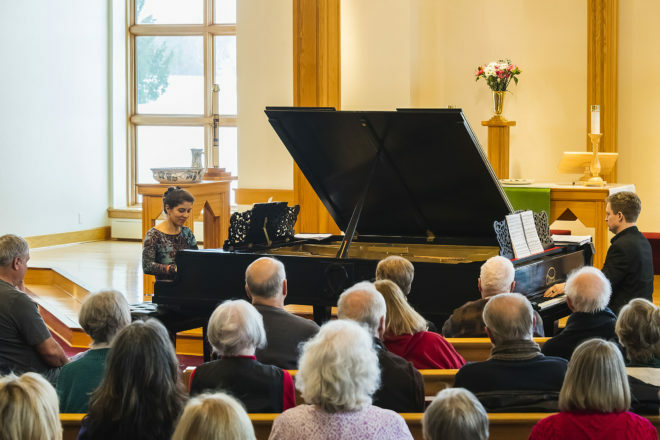 Inna Faliks, left, and Andrew Armstrong, right, perform on Peter Nehlsen’s Omega double piano at Shepherd of the Bay Lutheran Church at the first in the Peninsula Music Festival February Fest concert series. Photo by Len Villano. I’ve often wondered what it was like for audience members who heard George Gershwin’s revolutionary Rhapsody in Blue performed by Paul Whiteman and his Palais Royal Orchestra the night of Feb. 12, 1924 – Gershwin himself at the piano, improvising his way through the hastily conceived piece (but that’s another story). It was the welcome debut of “symphonic jazz,” and I’ve always thought of it as a spine-tingling musical experience – one of those “if I could go back in time” moments. After attending the first concert in the Peninsula Music Fest’s (PMF) February Fest on Feb. 9 at Shepherd of the Bay Lutheran Church, I feel closer to that moment felt by the audience 95 years ago after hearing the work performed by two great pianists on Washington Islander Peter Nehlsen’s Omega double piano. 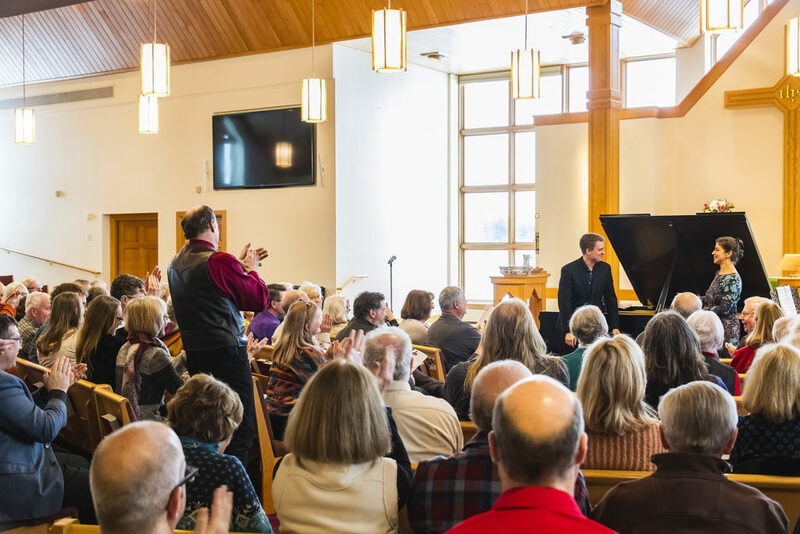 The opening concert in the February series at the Ellison Bay church began with a presentation by Nehlsen on the making of the two-keyboard piano. 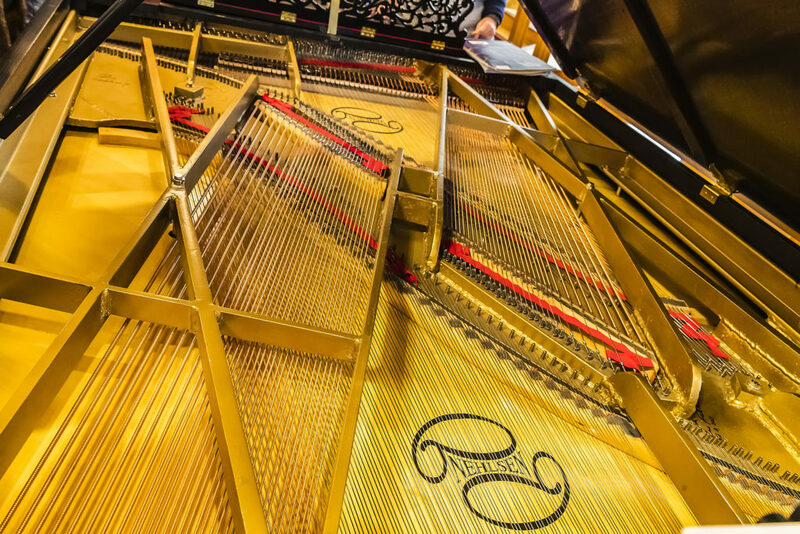 To perform on this unique instrument, PMF enlisted Inna Faliks, who serves as head of piano and associate professor of piano at UCLA’s Herb Alpert School of Music, and who was making her third appearance as a PMF guest artist (her last appearance was performing Beethoven’s Piano Concerto No. 1 last August), and Andrew Armstrong, a Massachusetts-based pianist and popular PMF guest artist who last performed Mozart’s Piano Concerto No. 12 last August. Nehlsen gave a brief history of the Victorian-era “explosion” of music written for two pianos and the commensurate growth in double-keyboard pianos. He mentioned the Pleyel Company’s double grand as his inspiration. Pleyel was a French piano maker that had the distinction of producing Chopin’s favorite piano (he had two Pleyels; the company closed its door in 2013). Many of the double pianos were bombed out of existence during World War II, Nehlsen said, adding that three of them turned up recently. There are 228 strings on each end, with roughly 200 pounds of tension each, amounting to approximately 50,000 pounds of tension. “If there’s any wiggle, it’s not going to hold a tune,” said Nehlsen, who is well known among owners of pianos as Door County’s piano tuner. When he showed up to tune Pulse photographer Len Villano’s piano, he arrived in a Washington Island fire truck, doing double duty by tuning a piano and bringing the truck to the mainland for repair. Nehlsen continually referred to the power of the instrument and how that power would be revealed in the coming concert by the two pianists. In fact, his entertaining talk and photo show about the building of the Omega was an excellent introduction to what pianists Andrew Armstrong and Inna Faliks had in store. Andrew Armstrong came out first and charmed the couple hundred attendees in an engaging and self-deprecating manner to introduce the first piece – a change from the program, which listed him as performing Aaron Jay Kermis’ Before Sleep and Dreams. Instead, he said he would play the first part of the only piece of music he has ever written, which he composed as a gift for a Seattle couple that has served as his “host parents” when he performs there. Inna Faliks then came out to play two pieces by Liszt, one on each side of the piano. She assured the audience that each side has its own personality, and she then proceeded to show her own distinct personality as a soulful pianist. Armstrong returned to play on the same keyboard with Faliks “Dolly’s Garden,” the third piece in the six-part Dolly Suite by Gabriel Fauré. They then took opposite sides of the piano to perform two Hungarian Dances by Brahms before moving on to Austrian composer/conductor Alexander von Zemlinsky’s arrangement of Mahler’s “Andante Moderato” from Symphony No. 6, which the pianists described as transcendent and truly mystical. They dedicated the piece to the late Gretchen Maring, a PMF supporter and Armstrong’s former “host mother,” who died in December. The concert was capped by the magnificent, four-handed rendition of Rhapsody in Blue. The next offering on PMF’s February Fest is Feb. 16 at 2 pm, featuring PMF trumpeters Bruce Briney and Dan Grantham, along with Judith Jackson on piano and Greg Beem playing the Shepherd of the Bay pipe organ. The final concert in the series is Feb. 23 at 2 pm, featuring cellist Jeffrey Noel Lastrapes performing three suites for solo cello by Johann Sebastian Bach. To order tickets, visit musicfestival.com.